Southern Andes Mountains, Central Valley, Chile Winter/Spring 1997. 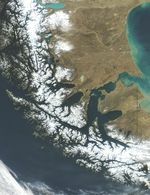 Many volcanic peaks, snowcapped ridges and glacial lakes of the southern Andes Mountains are visible in this southeast-looking view. 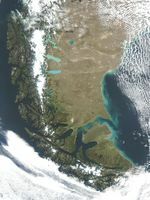 Between the mountains and the Pacific Ocean (lower right), the long, narrow, fertile Central Valley of Chile appears distinctly greener—on the wet side of the mountains—compared with the dry plains of Patagonia (top left). 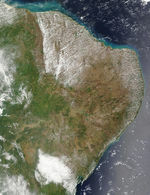 The Central Valley stretches southward to where it drops below sea level into the Gulf of Ancud (upper right). 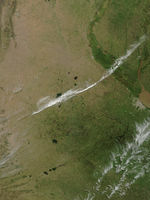 The glacial lakes of the forested slopes of the Andes begin with Lakes Colico, Caburgua, and Villarrica (bottom left portion of the image). Between Lakes Villarrica and Calafquén is the snow-covered stratovolcano Villarrica, which is active at this writing. 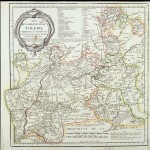 The large lake with the small island near its center is Lake Ranco. 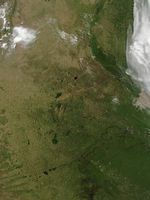 Just to the south-southeast of Lake Ranco and at the center of the image is the Cordillera Nevada. The narrow complex lake on the Patagonian side of the Cordillera Nevada is Lake Nahuel Huapi. The large lake at the southern end of the Central Valley is Llanquihue. 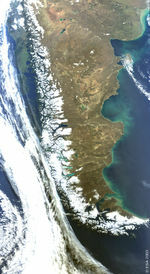 Chile’s major southern port of Puerto Montt is the small white patch at the north end of the Bay of Seno de Reloncavi (just south of Lake Llanquihue). Covering the upper left and top center of the image is the Patagonian Plateau..